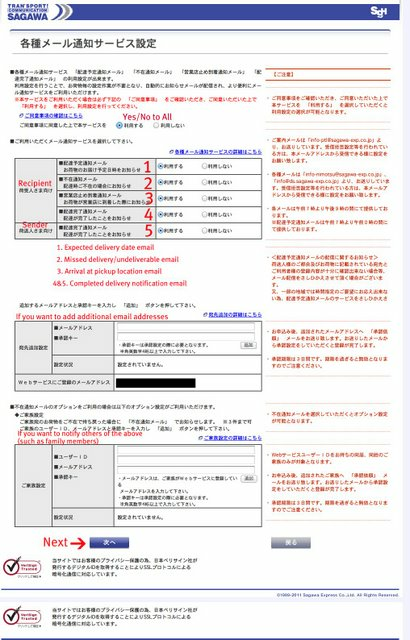 Next week a post is coming on how to arrange a redelivery online with the delivery company Sagawa. If you don't want to bother with calling (or find it too difficult), arranging a redelivery online is quick and easy once you've signed up and done it a few times. However, in order to do that, you first need to make an account, which I explain below. Go to this page (shown below). Enter your email address twice, choose computer or cell phone email, and click the blue button on the left to submit. After clicking submit, the following window will show up, and an email will be sent to your specified address. Go find the email and click the link it provides. 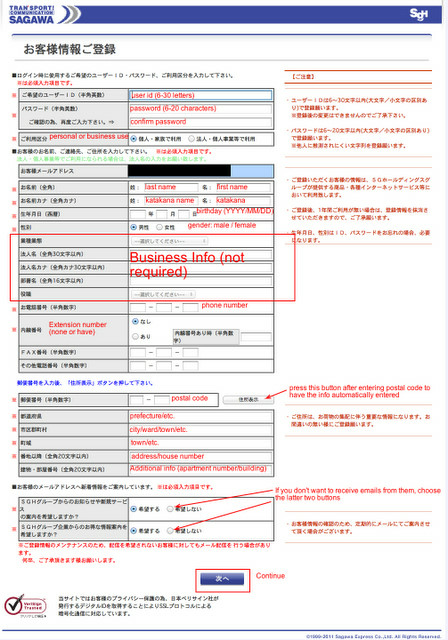 The page that shows up is all Sagawa's terms. Click the left button if you agree and wish to continue, or the right button if you don't. 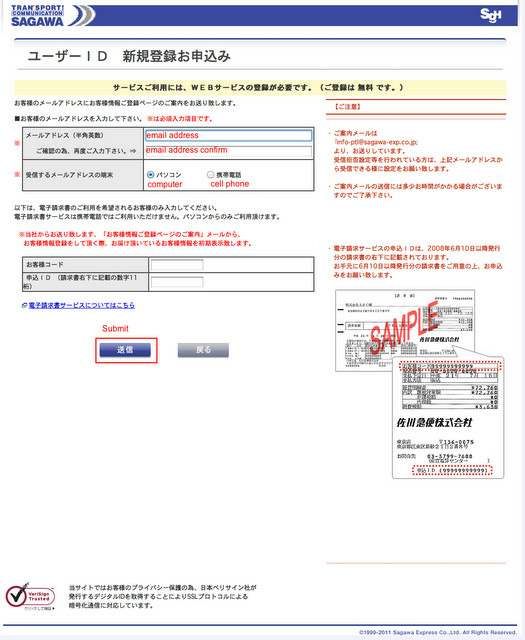 Now, time to fill out all your personal info. I've filled in each box in the example below with the English translation in red, so follow my prompts. Note: For the address numbers, you'll want to use the "full-width" numbers or type while you're in Japanese mode, so it would look like "１２３", instead of "123". 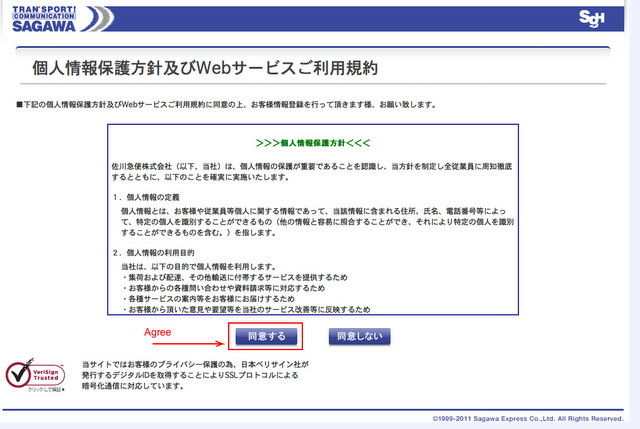 When I first signed up for Sagawa, a few years ago, they didn't have this survey (below), but for some reason they do now. 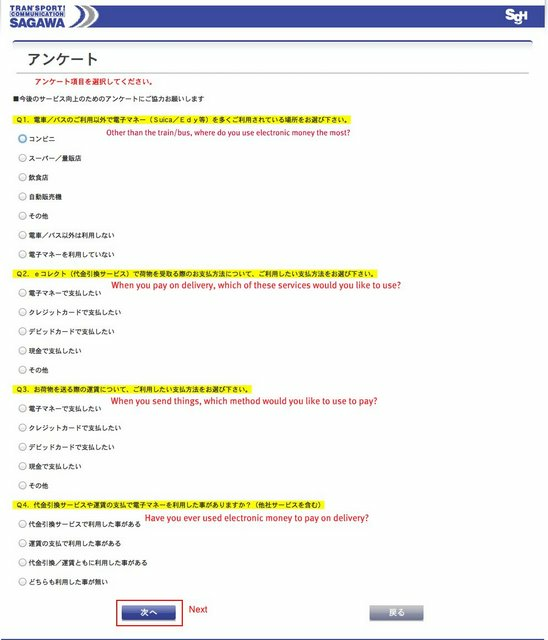 The translated questions are in red, though if you don't know any Japanese at all and don't care to translate the words, just choose an option for each. (For example, for the first question you might just choose "other" or その他 or one of the last two options meaning you don't use electronic money for anything other than the train/bus, or you don't use it at all.) It's just a survey, so it has no effect on your account. Once you've finished, click 次へ (next). If you want to receive notification emails from Sagawa, you can leave the default button at the top selected (利用する), but if you don't want to receive any at all, choose 利用しない. You can also leave the default selected and individually select each option. I've written the translations and corresponding numbers to each below the first large box. You don't need to worry about the second and third large boxes - the second is if you want to add another email addresses to have notifications sent to, and the third is if you want to add a family member to the notifications. 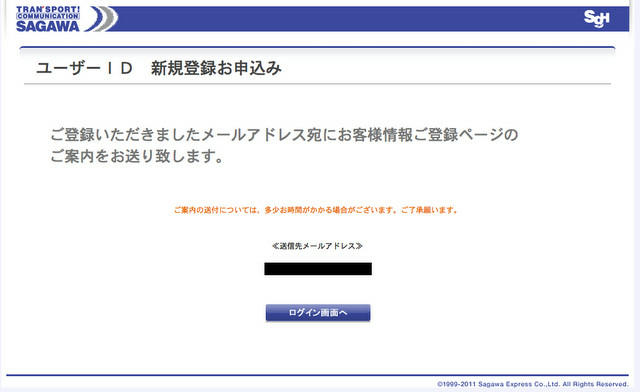 After all that, click 次へ (next). Almost done! 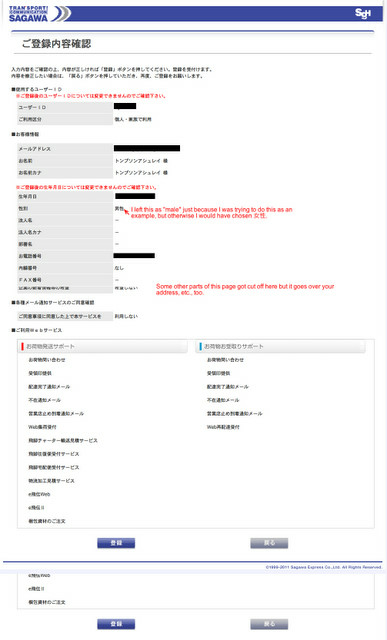 Now, just look over the information to confirm it's correct, and if it is, click the blue button on the left (登録). The lighter button on the right (戻る) takes you back a page. After that, you're done! Congrats, you now have a Sagawa account! Next week: how to arrange a redelivery with Sagawa.